Kiss & Tell … It’s In the Cards! This set of cards holds the forensic whisper of Anita Miranda, The Official Lipstick Reader. Now, you can have the power of your pucker reading in your hands … it’s all about the BRAND, baby. And, then, with the deck in hand, we refreshed and aligned the site to LAND, baby. Plus, we served up a digital assistant, providing color and dimension to reflect the vibrant messages gleaned in a kiss. So, now we offer the fun … check out the latest SWAK and SWAG. 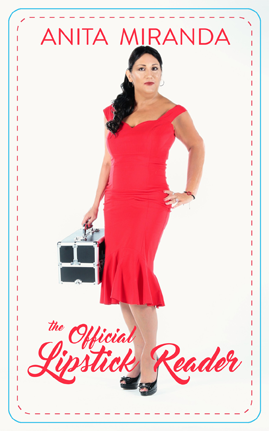 Via the website, social media, and appearances coast to coast, we LAUNCH your Official Lipstick Reader, Anita Miranda. 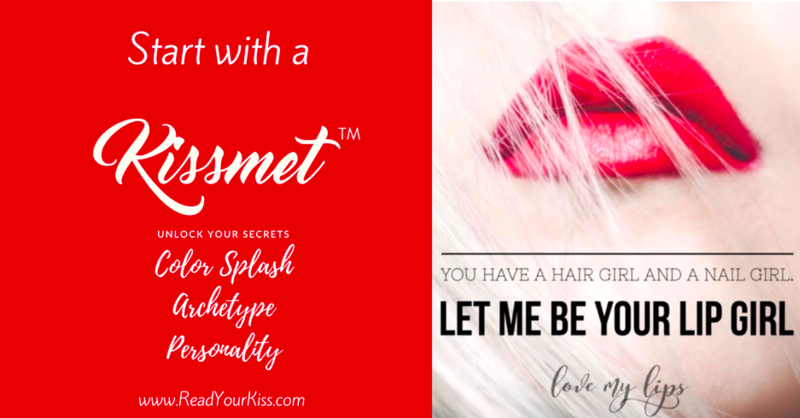 To punctuate the USP (Unique Selling Proposition), Tamara Parisio — Art & Industry and Parisio & Co LLC coined KISSmet™ for the Proprietary Process of the online digital experience. The Official Lipstick Reader is the first and only one to offer this insight for everyone to get a taste of a lipstick print reading. Create the deck. Shuffle the deck. SWAK & SWAG. A bit about Miranda. Is there really such a thing as a mother’s love? The kiss tells us so. My mother always said, “You are destined to be great. That is why I created you.” Fortunately I learned to believe that before I learned my mother was a Schizophrenic, and she said that to everyone. Often, mother would tell me that she could not care for me. Then she died when I was young. In my time of despair, hurt, and sorrow, I sensed a gentle kiss on my forehead. A perfect stillness overcame me, knowing ‘everything will be alright.’ I knew since then that my mother has my back. No matter what. And she showed me with a kiss. I was oblivious about life out in the world. I only knew what I knew. Live with strangers, don’t do drugs, don’t get pregnant, continue with education, and always wear lipstick! Growing up is my miracle. I was the kid who should have, could have been a statistic: either “little girl lost” or “crazy woman found.” I do believe life is what you make it. It’s a shuffled deck that’s shoved into your hands… or it’s a deck you create so you are in charge of your deal. I have learned to play to win, yet with the certainty of losing—sometimes. Can someone just get a newly shuffled deck at life? Can we decide either game over the life has to offer…or do something about it? That is what I decided when I was 15 years old. I made a choice to be ‘somebody’ and do ‘something’ amazing. And here I am, having created my own deck so that I can shuffle it, deal out the cards, and delight you with a lipstick print reading. The imprint of a kiss inspires me, over and over. Yes, I do believe life is a game. And how well the game is played is anyone’s guess. 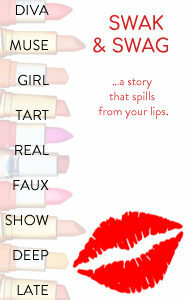 The forensics of a lipstick lip print reveal tendencies, emotion, and the happenings in your life. Your lips are expressive so the lipstick print will change with what is going on, now and then. And I bring my intuitive gifts to expand on the information to entertain you with insights about you. With just a SWAK you get insights and walk away with SWAG. I’m Anita Miranda, the founder of Miranda’s Creatives, LLC and Circle of Helping Hands charity, and THE OFFICIAL LIPSTICK READER. A Mother’s Kiss is my legacy. This is my gift. And I am delighted to share it with you. Sharing makes you an awesome human being. Share this project if you like it! Get in touch and let's explore possibilities for your projects.